Uzbekistan, officially the Republic of Uzbekistan ( Uzbek: O‘zbekiston Respublikasi or O‘zbekiston Jumhuriyati), is a doubly landlocked country in Central Asia. It shares borders with Kazakhstan to the west and to the north, Kyrgyzstan and Tajikistan to the east, and Afghanistan and Turkmenistan to the south. This gives Uzbekistan a rather unusual status shared only with Europe's Liechtenstein in that their nation is surrounded entirely by other landlocked states. The language, Uzbek, is a Turkic language mutually intelligible with Turkish and other Turkic languages. Some sources estimate that Tajiks, an ethnic group closely related to Persians, make up approximately 42% of the population. The word "Ozbek" means, Real/original/true (Oz) Leaders, Nobles (bek). The territory of Uzbekistan was populated in the second millennium BC. There are findings of early human tools and monuments in Ferghana, Tashkent, Bukhara, Khorezm (Khwarezm, Chorasmia) and Samarkand regions. The first civilizations to appear in Uzbekistan were Sogdiana, Bactria and Khwarezm (Chorasmia). Territories of these states became a part of the Persian Achaemenid empire in the 6th century, hence becoming part of Persia for centuries. In fact, Persian culture is preserved in Uzbekistan even today, as is evident in many areas where Persian is spoken. Alexander the Great conquered Sogdiana and Bactria in 327 BC, marrying Roxana, daughter of a local Sogdian chieftain. However, the conquest was supposedly of little help to Alexander as popular resistance was fierce, causing Alexander's army to be bogged down in the region. For many centuries the region of Uzbekistan was ruled by Iranian Empires such as the Parthian and Sassanid Empires. In the 14th century, Timur, known in the west as Tamerlane, overpowered the Mongols and built an empire. In his military campaigns Tamerlane reached as far as the Middle East. He defeated Ottoman Emperor Bayezid I. The war is known to be the only war in history where a Turkic country fought against another Turkic country. Bayezid was captured, and died in captivity. Tamerlane sought to build a capital of his empire in Samarkand (largely a Tajik-populated city). Today Tamerlane is considered to be one of the greatest heroes in Uzbekistan who plays a significant role in its national identity and history. Following the fall of the Timurid Empire, Uzbek nomads conquered the region. In the 19th century, the Russian Empire began to expand, and spread into Central Asia. The " Great Game" period is generally regarded as running from approximately 1813 to the Anglo-Russian Convention of 1907. Following the Bolshevik Revolution of 1917 a second less intensive phase followed. At the start of the 19th century there were some 2,000 miles (3,200 km) separating British India and the outlying regions of the Tsarist Russia. Much of the land in between was unmapped. By the beginning of the 20th century, Central Asia was firmly in the hands of Russia and despite some early resistance to Bolsheviks, Uzbekistan and the rest of Central Asia became a part of the Soviet Union. On August 31, 1991, Uzbekistan reluctantly declared independence, marking September 1 as a national holiday. In subsequent ethnic tensions, two million Russians left the country for Russia. The country now seeks to gradually lessen its dependence on agriculture - it is the world's second-largest exporter of cotton - while developing its mineral and petroleum reserves. Constitutionally, the Government of Uzbekistan provides for democracy. In reality, the executive holds a great deal of power. However, recently the judiciary become more independent and the parliament (Oliy Majlis) has more power to shape laws. Under terms of a December 1995 referendum, Islom Karimov's first term was extended. Another national referendum was held January 27, 2002 to yet again extend Karimov's term. The referendum passed and Karimov's term was extended by act of the parliament to December 2007. Most international observers refused to participate in the process and did not recognize the results, dismissing them as not meeting basic standards. The 2002 referendum also included a plan to create a bicameral parliament, consisting of a lower house (the Oliy Majlis) and an upper house (Senate). Members of the lower house are to be "full time" legislators. Elections for the new bicameral parliament took place on December 26, but no truly independent opposition candidates or parties were able to take part. The OSCE limited observation mission concluded that the elections fell significantly short of OSCE commitments and other international standards for democratic elections. Several political parties have been formed with government approval. Similarly, although multiple media outlets (radio, TV, newspaper) have been established, these either remain under government control or rarely broach political topics. Independent political parties were allowed to organize, recruit members, and hold conventions and press conferences, but have been denied registration under restrictive registration procedures. Terrorist bombings were carried out March 28-April 1, 2004 in Tashkent and Bukhara. The Constitution of the Republic of Uzbekistan asserts that "democracy in the Republic of Uzbekistan shall be based upon common human principles, according to which the highest value shall be the human being, his life, freedom, honour, dignity and other inalienable rights." However, credible non-government human right watchdogs, such as IHF, Human Rights Watch, Amnesty International, as well as United States Department of State and Council of the European Union define Uzbekistan as "an authoritarian state with limited civil rights" and express profound concern about "wide-scale violation of virtually all basic human rights" . According to the reports, the most widespread violations are torture, arbitrary arrests, and various restrictions of freedoms: of religion, of speech and press, of free association and assembly . The reports maintain that the violations are most often committed against members of religious organizations, independent journalists, human right activists, and political activists, including members of the banned opposition parties. In 2005, Uzbekistan was included into Freedom House's "The Worst of the Worst: The World's Most Repressive Societies". The official position is summarized in a memorandum "The measures taken by the government of the Republic of Uzbekistan in the field of providing and encouraging human rights" and amounts to the following. The government does everything that is in its power to protect and to guarantee the human rights of Uzbek citizens. Uzbekistan continuously improves its laws and institutions in order to create a more humane society. Over 300 laws regulating the rights and basic freedoms of the people have been passed by the parliament. For instance, an office of Ombudsman was established in 1996 . On August 2, 2005, President Islam Karimov signed a decree that will abolish capital punishment in Uzbekistan on January 1, 2008. The May 2005 unrest in Uzbekistan, which resulted in several hundred people being killed is viewed by many as a landmark event in the history of human rights abuse in Uzbekistan , , . A concern has been expressed and a request for an independent investigation of the events has been made by the United States, European Union, the UN, the OSCE Chairman-in-Office and the OSCE Office for Democratic Institutions and Human Rights. The government of Uzbekistan is accused of unlawful termination of human life, denying its citizens freedom of assembly and freedom of expression. The government vehemently rebuffs the accusations, maintaining that it merely conducted an anti-terrorist operation, exercising only necessary force . In addition, some Uzbek officials claim that "an information war on Uzbekistan has been declared" and the human rights violations in Andijan are invented by the enemies of Uzbekistan as a convenient pretext for intervention into the country's internal affairs . Uzbekistan is approximately the size of Morocco or California and has an area of 447,400 square kilometers (172,700 sq mi). It is the 56th-largest country (after Sweden). Uzbekistan stretches 1,425 kilometers (885 mi) from west to east and 930 kilometers (578 mi) from north to south. Bordering Turkmenistan to the southwest, Kazakhstan and the Aral Sea to the north, and Tajikistan and Kyrgyzstan to the south and east, Uzbekistan is not only one of the larger Central Asian states but also the only Central Asian state to border all of the other four. Uzbekistan also shares a short border with Afghanistan to the south. Uzbekistan is a dry, double- landlocked country of which 10% consists of intensely cultivated, irrigated river valleys. It is one of two double-landlocked countries in the world - the other being Liechtenstein, although in the case of Uzbekistan this is less clear, since it has borders with two countries (Kazakhstan in the north and Turkmenistan in the south) bordering the landlocked but non-freshwater Caspian Sea from which ships can reach the Sea of Azov and thus the Black Sea, the Mediterranean Sea and the oceans. The highest point in Uzbekistan is Adelunga Toghi at 4,301 meters (14,111 ft). 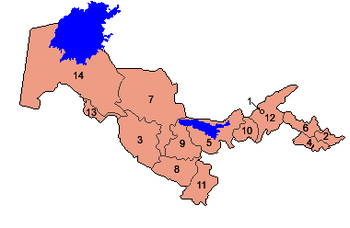 Uzbekistan is divided into 12 provinces (viloyatlar, singular - viloyat, [viloyati] in compound, e.g. 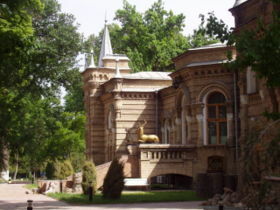 Toshkent viloyati, Samarqand viloyati), 1 autonomous republic ([respublika], respublikasi in compound, e.g. Qaraqalpaqstan Avtonom Respublikasi, Karakalpakistan Autonomous Republic), and 1 independent city ([shahar] or [shahri] in compounds, e.g. 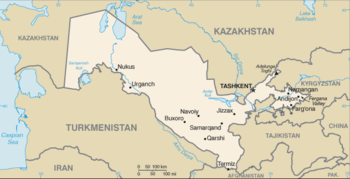 the Tashkent city with a K, Toshkent shahri). Names are given below in the Uzbek language, although numerous variations of the transliterations of each name exist. The statistics for Toshkent Viloyati also include the statistics for Toshkent Shahri. There are four Uzbek Exclaves, all of them surrounded by Kyrgyz territory in the Fergana valley region where Kyrgyzstan, Tajikistan and Uzbekistan meet. Two of them are the towns of: Sokh, area of 325 km² (125 sq mi) with a population of 42,800 in 1993 (although some estimates go as high as 70,000) (99% are Tajiks and the remainder Uzbeks ); and Shakhrimardan (also known as Shakirmardon or Shah-i-Mardan), area of 90 km² (35 sq mi) with a population of 5,100 in 1993 (91% are Uzbeks and the remainder Kyrgyz). The other two are the tiny territories of Chong-Kara (or Kalacha), roughly 3 km (1.9 mi) long by 1 km (0.6 mi) wide, and Dzhangail, a dot of land barely 2 or 3 km (1.5 mi) across. Chong-Kara is on the Sokh river, between the Uzbek border and the Sokh exclave. Uzbekistan has a Tajikistan enclave, the village of Sarvan, which includes a narrow, long strip of land about 15 km (9 mi) long by 1 km (0.6 mi) wide, alongside the road from Angren to Kokand. Last but not least, there is a tiny Kyrgyzstan enclave, the village of Barak (population 627), between the towns of Margilan and Fergana. Uzbekistan is a country with a GNI per capita of US$460 and PPP equivalent of US$1860 . Economic production is concentrated in commodities: Uzbekistan is now the world's fourth-largest producer and the world's second-largest exporter of cotton and the seventh world major producer of gold. It is also a regionally significant producer of natural gas, coal, copper, oil, silver, and uranium . Agriculture contributes about 37% of GDP while employing 44% of the labor force . Unemployment and underemployment are estimated to be at least 20% . Much of Uzbekistan’s GDP growth comes from favourable prices for certain key exports, especially cotton, gold, and, increasingly, gas, but the revenues from these commodities are distributed among a very small circle of the ruling elite, with little or no benefit for the populace at large. , . According to the Economist Intelligence Unit, "the government is hostile to allowing the development of an independent private sector, over which it would have no control" . Thus, the national bourgeoisie in general, and the middle class in particular, are marginalized economically, and, consequently, politically. The economic policies have repelled foreign investment, which is the lowest per capita in the CIS . For years, the largest barrier to foreign companies entering the Uzbek market has been difficulty in currency conversion. In 2003, the government accepted the obligations of Article VIII under the International Monetary Fund , providing for full currency convertibility. However, strict currency controls and tightening of borders have lessened its effects. Inflation, though lower than in the mid-1990s, remained high up until 2003 (estimated 50% in 2002, 21.9% in 2003, ). Tight economic policies in 2004 resulted in drastic reduction of inflation, to 3.8% (while alternative estimates based on price of true market basket, put it at 15%). However, the relief appears to be transient, as IMF estimate of CPI-based inflation in Uzbekistan in 2005 is 14.1% . The government of Uzbekistan restricts imports in many ways, including high import duties. Excise taxes are applied in a highly discriminatory manner to protect locally produced goods. Official tariffs are combined with unofficial, discriminatory charges resulting in total charges amounting to as much as 100 to 150 percent of the actual value of the product, making imported products virtually unaffordable . Import substitution is an officially declared policy and the government proudly reports reduction in the consumer goods import by a factor of two. A number of the CIS countries are officially exempt from Uzbekistan import duties. Uzbekistan is Central Asia's most populous country. Its 26 million people, concentrated in the south and east of the country, comprise nearly half the region's total population. Uzbekistan had been one of the poorest republics of the Soviet Union; much of its population was engaged in cotton farming in small rural collective farms ( kolkhozy). In the recent years, the fraction of the rural population has continued to increase now reaching 63.5%. The population of Uzbekistan is very young: 34.1% of it are people younger than 14. Uzbekistan is predominantly Uzbek in ethnic composition. According to the CIA World Factbook , Uzbeks comprise 80% of the total population. Other ethnic groups include Russian 5.5%, Tajik 5%, Kazakhs 3%, Karakalpak 2.5%, and Tatar 1.5%. However, some sources put the percentage of Tajik population of Uzbekistan at approximately 42% (11-14 million people) . The nation is 88% Muslim (mostly Sunni, with a 5% Shi'a minority) and 9% Eastern Orthodox. Uzbek is the only official state language. However, Russian is the de facto language for interethnic communication, including much day-to-day technical, scientific, governmental and business use. According to Ethnologue, 49% of the population of Uzbekistan can speak Russian. According to government figures about 817,000 disabled people were registered in Uzbekistan in 2003. This figure only shows how many disabled people have been registered according to Uzbek law. As many disabled people do not have the chance to get registered (due to knowledge about the legislation and difficulties to go through the registration procedure) it can be assumed that many more people are disabled. The World Health Organisation estimates that about 10% of each population have a disability. According to the WHO estimations the number of 2.5 million disabled people is more realistic. The name Uzbek, both for the people and for the nation itself, is said to be self-referential from the period the Russians first encountered the people, parsing as ozum bek, or "I am the lord (or ruler)". Uzbekistan enjoys 99.3% literacy rate (among adults older than 15) which, in part, is attributable to the free and universal high-quality education system of the Soviet Union. According to the official source report, by the end of 2004, there were 544.1 thousand users of cellular phones in Uzbekistan (an increase of 168% since the beginning of the year). An independent source, Ferghana.Ru, claims, however, that the users of cellular phones in Uzbekistan was only 450,000. The number of Internet providers and operators by the end of 2004 was 477 (+181.4%). There were 675,000 Internet users in the country (+137%). 96.4% cities and 72.5% district centers have digital telecommunications systems. Tashkent, the nation's capital and largest city, has a 4 lines subway built in 1977, and expanded 2001 after independence from the Soviet Union. There are government operated trams, buses and trolleybuses (buses connected to the electric cables above them) running across the city. Also there are many taxis, both registered and not registered. The train links are good. They connect many towns within Uzbekistan as well as with neighbouring ex-republics of the Soviet Union. Uzbekistan possesses the largest military force in the Central Asian region, having around 65,000 people in uniform. Its structure is inherited from the Soviet armed forces, although it is moving rapidly toward a fully restructured organization, which will eventually be built around light and Special Forces. The Uzbek Armed Forces' equipment is not modern, and training, while improving, is neither uniform nor adequate for its new mission of territorial security. The government has accepted the arms control obligations of the former Soviet Union, acceded to the Nuclear Non-Proliferation Treaty (as a non-nuclear state), and supported an active program by the U.S. Defense Threat Reduction Agency (DTRA) in western Uzbekistan (Nukus and Vozrozhdeniye Island). The Government of Uzbekistan spends about 3.7% of GDP on the military but has received a growing infusion of Foreign Military Financing (FMF) and other security assistance funds since 1998. Uzbekistan approved the U.S. Central Command's request for access to a vital military air base, Karshi-Khanabad Airbase, in southern Uzbekistan following the September 11, 2001 terrorist attacks in the U.S. After the Andijan riot and subsequent U.S. reaction, Uzbekistan demanded that the U.S. withdraw from the airbases. The last US troops left Uzbekistan in November 2005. Uzbekistan joined the Commonwealth of Independent States in December 1991. However, it is opposed to reintegration and withdrew from the CIS collective security arrangement in 1999. Since that time, Uzbekistan has participated in the CIS peacekeeping force in Tajikistan and in UN-organized groups to help resolve the Tajik and Afghan conflicts, both of which it sees as posing threats to its own stability. Uzbekistan was an active supporter of U.S. efforts against worldwide terrorism and joined the coalitions that have dealt with both Afghanistan and Iraq. The relationship between Uzbekistan and the United States began to deteriorate after the so-called " colour revolutions" in Georgia and Ukraine (and to a lesser extent Kyrgystan). 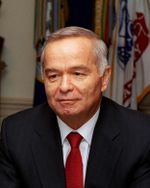 When the U.S. joined in a call for an independent international investigation of the bloody events at Andijon, the relationship took an additional nosedive and President Islam Karimov changed the political alignment of the country closer to Russia and China, countries which chose not to criticize Uzbekistan's leaders for the alleged human rights violations. In late July, 2005, the government of Uzbekistan ordered the United States to vacate an air base in Karshi-Kanabad (near the Uzbek border with Afghanistan) within 180 days. Karimov had offered use of the base to the U.S. shortly after 9/11. It is also believed by some Uzbeks that the protests in Andijan were inspired seclusively by the UK and US influences in the area of Andijan. So far, this is another reason for the hostility between Uzbekistan and the West. It is a member of the United Nations, the Euro-Atlantic Partnership Council, Partnership for Peace, and the Organization for Security and Cooperation in Europe (OSCE). It belongs to the Organization of the Islamic Conference (OIC) and the Economic Cooperation Organization--comprised of the five Central Asian countries, Azerbaijan, Turkey, Iran, Afghanistan, and Pakistan. In 1999, Uzbekistan joined the GUAM alliance (Georgia, Ukraine, Azerbaijan and Moldova), which was formed in 1997 (making it GUUAM), but pulled out of the organization in 2005. Uzbekistan is also a member of the Shanghai Cooperation Organization (SCO) and hosts the SCO’s Regional Anti-Terrorist Structure (RATS) in Tashkent. Uzbekistan also joined the new Central Asian Cooperation Organization (CACO) in 2002. The CACO consists of Uzbekistan, Tajikistan, Kazakhstan, and Kyrgyzstan. It is a founding member of and remains involved in the Central Asian Union, formed with Kazakhstan and Kyrgyzstan, joined in March, 1998, by Tajikistan. In September the UNESCO presented Islam Karimov an award for Uzbekistan's preservation of its rich culture and traditions. Despite the fact that the former received criticism, this seems to be a sign of ameliorating relationships between Uzbekistan and the West. The month of October 2006 tends to decrease the isolation of Uzbekistan from the West. The EU recently announced that it was planning to send its delegation to Uzbekistan to talk about human rights and liberties after a long time of hostile relations between the two. Although it is not completely decisive on whether the official or unofficial version about the Andijan Massacre is true, the EU showed concern at easing its economic sanctions against Uzbekistan. Nevertheless, it is highly assumed among the Uzbek population that the Uzbek government will stand firm in maintaining its close ties with the Russian Federation and in its critique that the 2004-2005 protests in Uzbekistan were promoted by the USA and UK.